It’s a cliché, we know, but some clichés stick around for a reason. Food (and beverages, to some extent) turn into the sugars, fats, amino acids, and other things that keep us alive. There’s lots of talk about how people eat right now because of the country’s obesity epidemic and a renewed focus on enjoying healthy foods. But how does the way you eat affect the way you work? Research shows there’s a big link between eating well and being productive at work. 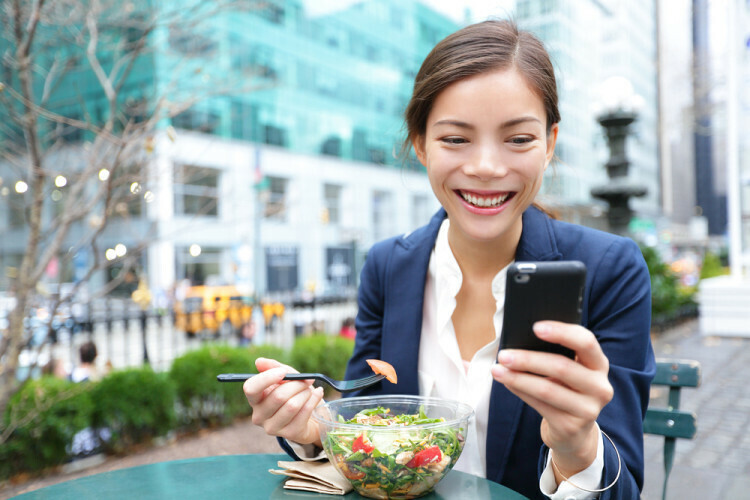 How can you eat your way to a more effective, efficient workday? We have the scoop. Your body converts everything you eat into glucose, a type of sugar. That glucose goes into your bloodstream, where it travels to nearly every part of your body—including your brain. It’s what keeps your mind functioning at its peak. Once your body has converted all the food you’ve eaten into glucose, it begins to run out of fuel. That’s when your blood sugar level starts to dip and you begin to feel hungry. The result? Irritability and an inability to concentrate. You know you don’t do your best work when you’re feeling famished. But there’s also a long-term consequence of not eating well. People with a poor diet are less healthy overall—and less productive. One survey found that people with a poor nutritional balance took 21 percent more sick days and were 11 percent less productive than colleagues who ate better. It also found that the 25 percent healthiest workers were seven hours more productive every week than the workers who made up the least healthy 25 percent. That’s equates to nearly one more day of work time every week. Now that you know why eating well will make you more productive at work, let’s talk about how you can eat better. We’ll start at the beginning of your day. Mom was right when she warned against skipping breakfast. The literal meaning of the term is “break fast.” The first meal of the day is designed to break the body’s overnight period of fasting and give it energy for the day ahead. Research has shown that people who eat breakfast are more likely to maintain a healthy weight, eat better later in the day, and stay alert and focused at work. However, there have been dozens of studies on how eating a healthy breakfast helps children perform better at school. Most have found that when kids eat breakfast, they have better cognitive performance, particularly with memory and attention; fewer behavioral problems; a higher level of nutrients such as the B vitamins and vitamin D; and a decreased likelihood of being overweight. It’s not much of a stretch to imagine that eating breakfast has a big effect on worker productivity, too. Action: Eat something for breakfast—and make sure that something is healthy. Keep easy-to-grab items like cold cereal, muesli, made-from-scratch breakfast sandwiches, and fruit with yogurt on hand so you don’t run out of time to fix something in the morning. Be careful of items that seem healthy but aren’t, such as high-sugar instant oatmeal and granola. Employers might also consider hosting an occasional free breakfast event with healthy choices for employees. See Also: What Are the Best Foods to Snack On at Work? For lunch, focus on fruits and veggies, and try getting outside. 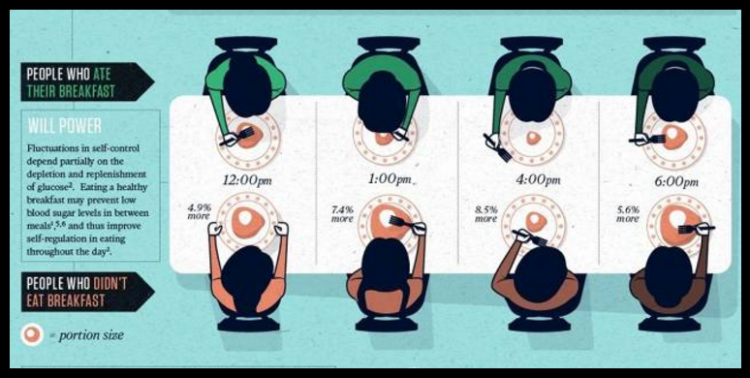 When noon rolls around, how can you make good decisions about what to eat? Let’s go back to the science of food for a moment. 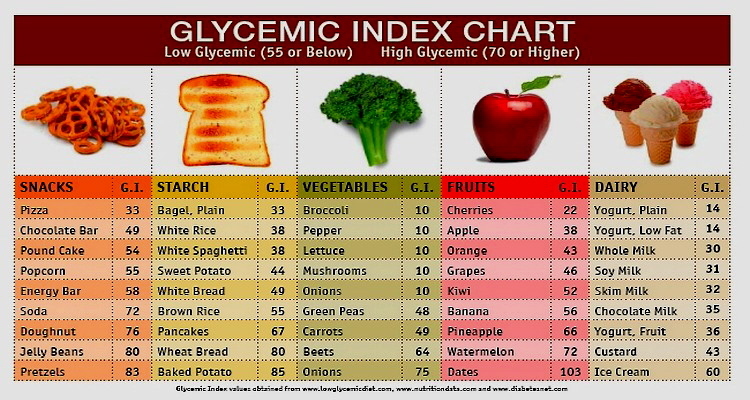 Since you want a consistent supply of glucose to your brain, it’s a good idea to eat foods with a low glycemic index. They take longer to break down and will provide the body with glucose for a longer period of time. Low glycemic foods include whole grains, sweet potatoes, and most fruits and vegetables. On the other hand, foods with a high glycemic index break down quickly. They provide the body with a boost in energy, but that increase is almost always followed by a sharp decrease. Foods with a high glycemic index include sugary snacks, starchy vegetables like potatoes and white bread. It’s a good idea to include some protein in your lunchtime meal; protein will help you feel full longer and keep you from reaching for junk food in the afternoon. Items high in protein include meat, dairy, beans, and nuts. You should also look for foods packed full of vitamins and minerals. In many cases that means reaching for fruits and vegetables, but they aren’t the only sources of the good stuff. There’s been a lot of research lately into omega-3 fatty acids. This “healthy fat” has been linked to lower occurrences of mental disorders like depression and ADHD, and is found in oily fish like tuna and salmon, flax seeds, and walnuts. Don’t make eating decisions when you’re hungry. Everyone knows it’s a bad idea to go to the grocery store when you’re hungry. The same applies to choosing where to eat lunch. If you plan to eat out, decide where you’ll go in the morning. You’re more likely to choose a place with a salad bar over a hamburger joint. A healthy meal isn’t just about what you eat. It’s about how much you eat. When you wolf down a big meal, your body has to put a lot of energy into converting all those nutrients into glucose. That means it redirects a lot of energy to your small intestine and away from other bodily functions. In addition, when large quantities of glucose start flowing to your brain, it triggers a group of specialized neurons to produce orexin, which moderates wakefulness in the brain. Too much of it and you start to feel sleepy. Take your lunch break. Studies show that getting out of the office can improve your mood and lower your stress level, which also increases productivity. Just the act of standing up will make your healthier. Numerous studies (including one from American College of Sports Medicine) have shown that sitting all day can increase your risk of heart disease. Action: Take a lunch break outside your office—or at least take the long way to the company fridge. Eat a reasonably-sized, balanced meal that includes foods with a low glycemic index, some protein, and brain-boosting foods. If you crave something sweet after lunch, eat berries, a piece of fruit, or a square of dark chocolate. If you’re buying food for a working lunch with your co-workers, try suggesting healthy options. Noshing between meals can have a positive impact on worker productivity. Enjoying a small, healthy snack between meals if you feel hungry means you will have fewer dips in your blood sugar during the day. It also means you are less likely to consume big meals that leave you feeling groggy. Action: Keep healthy snacks on hand. That way you aren’t tempted to go to the vending machine or raid the box of donuts in the break room when you start to feel hungry. Non-perishable foods you can keep in your desk include dried nuts and fruit, low-sugar energy bars, and whole grain crackers. If your company has a refrigerator, stock it weekly with cut-up veggies, fruit, and cheese. 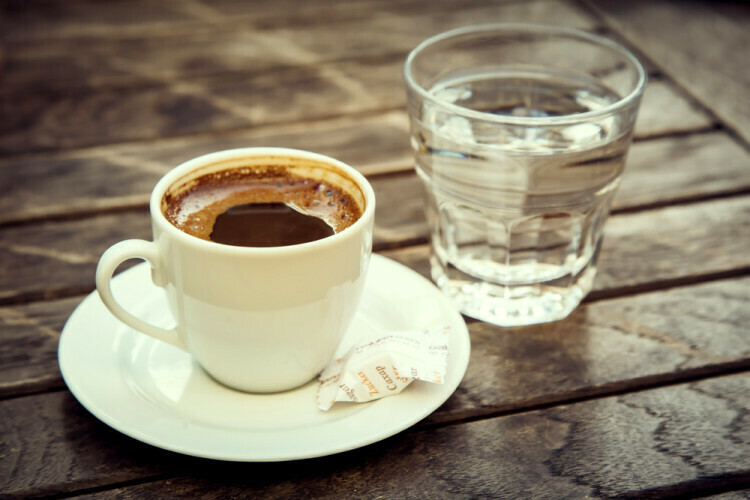 Coffee and water have their individual benefits, so try keeping both close at hand. Coffee is hugely popular with workers all over the world, and it’s easy to see why. Caffeine is a stimulant that helps you stay awake and alert. A study showed that people working the night shift who drank coffee make fewer errors and get fewer injuries than those who didn’t drink anything with caffeine. Coffee has also been linked to decreasing your risk for certain diseases, lowering depression, and helping you get more physically fit. A beverage that’s quite important to worker productivity but almost always gets overlooked is water. Sixty-five percent of the human body is made up of water, and 85 percent of the brain is water. When this essential organ doesn’t have enough water, it can lead to poor short-term memory, an inability to focus, a higher stress level, and physical ailments like headaches. One study showed that people who drank water before an IQ test performed 14 times better than those who didn’t. Adults need about eight eight-ounce glasses of water every day to feel fully hydrated. The number can be slightly higher for people who drink lots of coffee or tea—the caffeine in these beverages can actually make you more dehydrated. Action: Whatever you drink at work, make sure you’re also getting enough water. Shoot for eight eight-ounce glasses over your entire day. Keeping a water bottle at your desk and drinking at least one glass of water with every meal can help you meet this goal. See Also: Do Corporate Wellness Plans Really Work? Eating and drinking right aren’t the only ways to increase your productivity. Exercising and quitting smoking can also have big effects. A study found that employees who didn’t exercise regularly were 50 percent more likely to see a loss in productivity. Those who smoked were 28 percent more likely to see a drop in productivity. Or, if you want to ignore all the advice in this article, just make sure you get enough sleep. Researchers at Cambridge University and Rand Europe found that getting seven hours of sleep did more for worker productivity than changing what people ate, drank, or if they smoked. A University of Michigan study found that taking a nap during the day lowered impulsiveness and irritability and raised overall productivity. That’s good news for anyone caught napping at their desk after a heavy lunch and not enough coffee. Action: Living a healthy lifestyle will help you increase your productivity at work. In addition to eating well, make sure you exercise, don’t smoke, and get enough sleep. See Also: How Much Sleep Do You Really Need? Sophia Bennett is a freelance writer and communications professional based in Eugene, Oregon. Her work has appeared on over two dozen blogs, magazines and newspapers including Produce Business, Wine Business Monthly, All About Beer, RecycleNation, Oregon Business, 1859 Oregon's Magazine and the Eugene Register-Guard. She also enjoys helping businesses promote the positive things they're doing by creating custom content and managing social media efforts. Sophia managed a professional association, worked as a business development consultant in the United Kingdom and helped start several recycling-based businesses before becoming a writer full-time. She enjoys reading, gardening, cooking, DIY projects, and spending time with her husband and twin daughters.